So, back on the 4th of this lovely and strange month, Kelly rescued me from an unemployed funk day of being stuck in the house. Kelly is probably the most selfless person i know, and offered to pick me up and hit the town for some tacos. No man comes closer to the grace of Ghandi than Kelly. After getting in the taco-mobile, Kelly, sensing i was feeling a little down, asked me what my soul craved besides my girlfriend. I paused and looked out the window, realizing it was a beautiful day. I answered as i normally do: “Tacos…. How about this supposed Liberty Park taco stand?”. By now, we know this mythical kitchen on wheels does exist, but at the time i was skeptical thinking that the city would never allow a taco stand in the park. I felt that this one was going to be hard to track down. 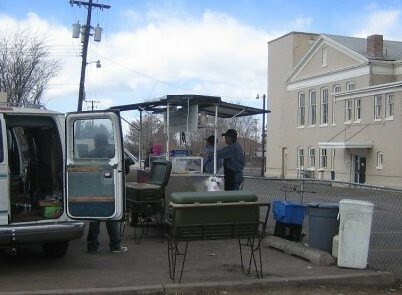 As we drove around Liberty, we did not see anything resembling a mobile haven for tortillas and meats. However, we did spot a dry erase board on the side of the road that seemed to point somewhere off in the distance, maybe Narnia, maybe it was pointed towards hell (Provo), or maybe someone was playing tricks on us. We decided we needed to hit this motherf*cker on foot, so we started walking around the park in search of it. We spotted another taco enthusiast in the park looking for this taco stand as well. He had expensive tracking equipment, and clearly had a 1-up on us. Taco enthusiast with the latest in taco tracking devices. Weary, tired and beaten down by “the man”, we gave up. “Screw this!” I say. So we do what anyone with an honest hunger for a taco would do. We went to one of the most deadly neighborhoods of Salt Lake, known for it’s presence of land mines, snipers and mean men sitting on couches on their front lawns with flame throwers. Kelly and I, however, are trained to handle these types of situations since we are professional taco eaters. We used to work up the road from this spot at Microsoft Games Studios/Indiebuilt and would frequent East Seas restaurant, which is across the street from this lovely taco stand. Tacos El Ranchero is situated in the parking lot of a laundry mat. It may look a little intimidating. If you’re a true taco enthusiast you’ll find yourself standing before a lovely array of condiments consisting of one of the best quacamole sauces, salsas, cabbage and other nibbly things. Since Kelly and I started working on this site, I made it a point to tell him that i was ready to take some changes and do things I haven’t done before. I promised him that i would sample every type of meat i came across, without fear. So to keep that promise, i ordered up two tasty Lengua (tongue) tacos, two Al Pastor, and two Carne Asada. After dressing my tacos i was ready to chow down on the lovely plate of food. This is a family site (yeahrite) so i put some clothes on these fellas. I love cucumbers, so i loaded up on quite a few. The first taco that was going to enter my mouth hole was the tongue taco. I’ve never made out with a cow before, so for a first time french kiss, i must say it was pretty damn good. Once i got past the somewhat sketchy texture, i let the taco do it’s little dance in my mouth. The tongue was tender and succulent, with flavors bursting from each cow taste bud i devoured. I highly recommend trying this if you never had. It tastes like the rest of the cow, kids. That, and you can tell your neighborhood friends you ate tongue and you still sleep at night without guilt. Next up, i threw the Al Pastor tacos down the hatch. By comparison to Chungas Al Pastor, these don’t really get close to the wonderment that an Al Pastor taco from Chungas can do for your solar plexus. That aside, these were good. Very good, in fact. The red hot sauce kindly provided by the condiment table accompanied these quite nice. Be careful of the red sauce though, as it’s a bit hot in comparison to some other hot sauces I’ve come across at taco stands. To finish things off, i end things with a solid standby, the Carne Asada tacos. The meat was flavorful, and seasoned wonderfully. It’s hard to do Carne Asada wrong, and the master chef at El Ranchero knows how to grill up this standard. My belly satisfied, it was time to return back to reality. Kelly returned to work, and i went back to my cave. The feelings I had that day still stay with me, as i fondly look back on March 4th. It was a day i will never forget, and i will definitely try to repeat when i come back to the neighborhood. Tacos El Ranchero is one of the better taco stands in the downtown area. 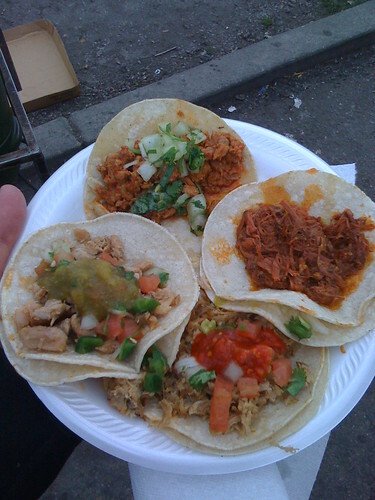 You really can’t go wrong with the street tacos produced here. A good friend, a sunny day, and a warm tortilla in your hand can do wonders for your body and soul. Go check it out. A happy bunch, enjoying ourselves. Taco Stand in Liberty Park as the sun sets on a beautiful spring day. 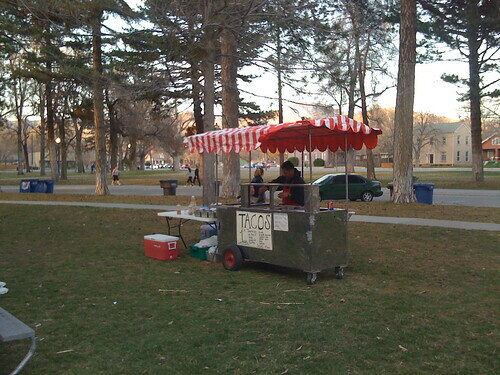 It’s been over two months now that I have been hearing reports of a taco stand in Liberty Park. I saw it once and I got excited. I love to go running there and I can’t think of a better idea than devouring a taco on each lap around the park. I saw a stand at the location mentioned once. I almost pulled over, but I didn’t have time that afternoon in January. For weeks as I drove home to sugarhood, I craned my neck to the west side of 700 East hoping that I would see the now mythical taco stand. For weeks my hopes were smashed like watermelons dropped from great heights. I even tried to visit this stand with Rob Tennant from the City Weekly while he was writing about taco stands. I told him I was pretty sure that the stand would be there. 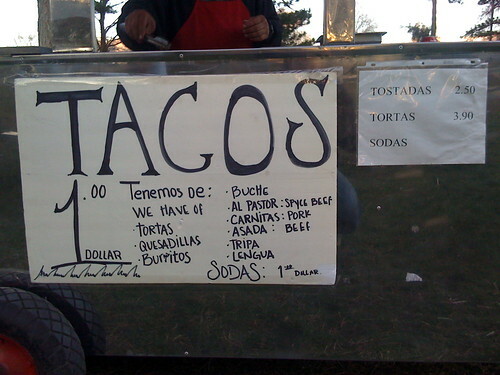 There even was a whiteboard reading “TACOS” with an arrow leading into the park. But no taco stand. I felt embarrassed that I dragged another taco journalist on a dead-end taco adventure. 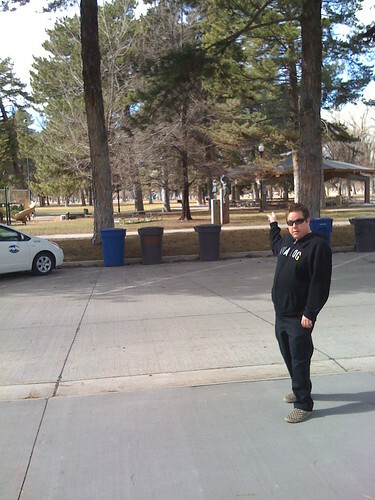 On a previous adventure, Noyen points to the mythical location of the taco stand. But this time it was not there. Then Noyen and I went there, sure to find a taco cart at our destination. But there was nothing there. We even interviewed a City Parks employee who had seen the cart in weeks gone by but had no credible leads as to where to find the taco stand. Things were starting to look dismal. I tried my best to console Noyen but it was difficult when I was distraught myself. Fast forward to March 18, 2009. A beautiful spring day. I peeked over again while heading down 700 E expecting to see nothing. Instead I saw a taco stand with people around it and smoke coming off of the grill. I instantly called taco enthousiast Carmen and told her that it was time to make a trip to the park. 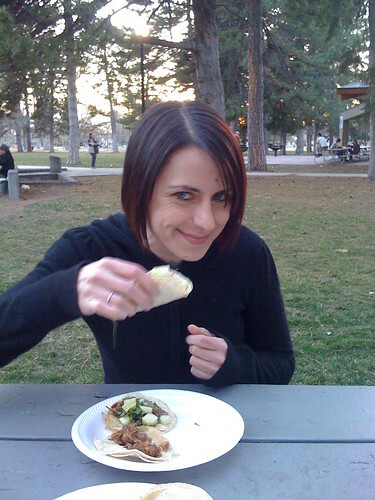 Taco enthousiast Carmen enjoying a delicious Carne Asada taco as the sun sets. 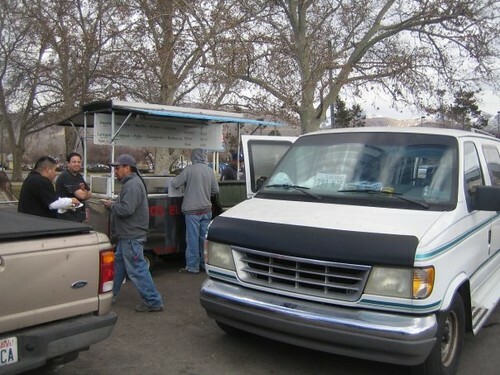 As we approached the taco stand we were instantly greeted by taco stand owner Ernie (Ernesto). I immediately yelled out “Ay, por fin! Ya hace ocho semanas que intento de encontrar este carrito en este lugar, y por fin estan!“, which translates roughly to “good lord I have been looking for this taco stand for a long time”. Ernie laughed and explained to me that there was a senora who was running the stand in the same location for a bit of time in January but she didn’t have enough time to run it. This is when Ernie stepped in and purchased the taco cart from the senora. Ernie explained that he has only been running the cart for the last week, but so far business has been good. At this moment I remembered that I had been conversing en espanol and so I started translating for taco enthousiast Carmen. Immediately after I translated the conversation, Ernie asked us in perfect English what we wanted. We ordered a starting round of 7 tacos (al pastor, lengua, pollo, and asada). As he made tacos, I asked Ernie where he was from and he started telling us stories of his home town of Guanajuato. I told him that although I had never been to the city I looked forward to visiting it someday. He told us about the mummies in Guanajuato. He told us about the tight and winding streets of the colonial city. In particular there is a street (alleyway) in Guanajuato which is extremely narrow and is named El Callejón del Beso. Legend has it that the street was so narrow that a man and woman fell in love as they lived in second story rooms which faced each other above this alley. The alley was so narrow that they were able to kiss each other from their windows. To read more about the story, click here. Soon our tacos were ready and we wasted no time tearing through our round 1 of 7 tacos, so we ordered 4 more. 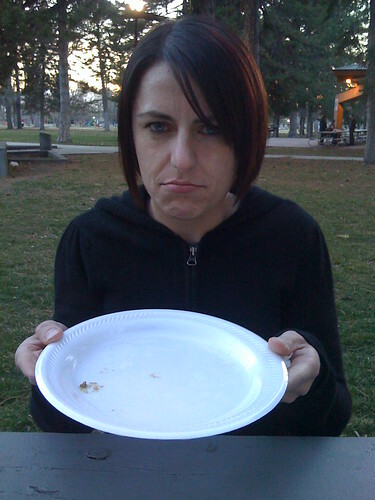 Carmen had nearly eaten the entire first round of tacos within 30 seconds. It was hard to stop eating since the prices at the stand are pretty good, and this is another of the best stands that Salt Lake has to offer. Of the tacos we tried, I enjoyed the lengua most. The meat was good quality and I think Carmen also enjoyed one without knowing what she was eating. The al pastor was also very delicious. This is another example of a better pastor than I’ve ever had around the Sears Corner area. I submit that there is not a better backdrop for a street taco than in Liberty Park. It’s a nice change to be able to sit on a park bench and enjoy a no-effort taco picnic while park goers pass by. I think that we need to somehow build up a taco challenge which consists of doing laps and eating tacos. Is anyone up to trying to eat one taco each lap while running laps around the park? 27 laps = 27 tacos. Seth? Are you up to it? I’m sure it would have to be easier than this challenge. Wouldn’t each taco be converted into pure energy by the time you come around again? I’m no doctor but I’d be willing to bet that this is the case. So go say hi to Ernie. He’s an incredibly nice guy. He says that now that he has been open for a week, he will try to be open from around noon until 8:30pm or as long as there is demand at night. Also check out his store La Perla Market on 567 E 600 S. They offer fresh meats and vegetables which almost certainly the product used at the taco stand. It’s possible you’ll see me too. I told Ernie that he and I were destined to become amigos since now I have a taco cart on my biking\automobiling route to and from work. Great restaurant with an incredible view. I'd love to go back when it's warmer and eat outdoors. I wasn’t particularly searching out great food down there but I did come across recommendations for a place which serves inventive, if not authentic, Mexican food. This place is called the Bit and Spur. I learned that not only did this place have a reputation for good food, it has a long musical tradition as well. 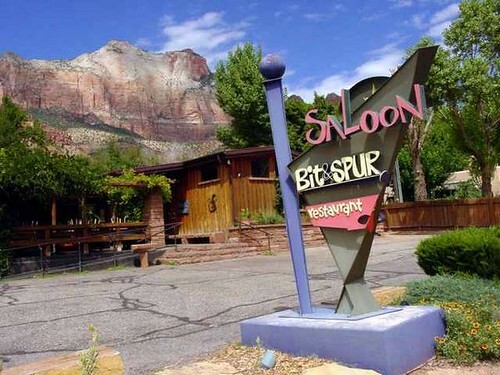 Taco enthousiast Jon Bray tells me that many bands have been known to play the Bit & Spur as they travel through Utah. With a history of over 20 years, there have been many musical acts which have played there including Jon’s band which played there in 1991. I looked around and found that several artists I knew and loved had played there. Check out the picture below and see if you recognize the gentlemen. 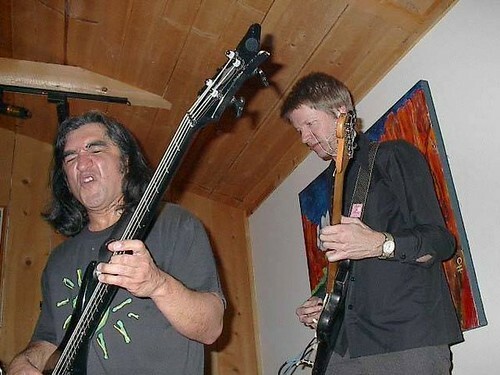 Yup, that's Jon Avila from Oingo Boingo and frequent visitor Nels Cline of Wilco fame. Just playing some playing some music at the Bit & Spur. How is it that I have never heard Nels Cline play while eating a taco? Who is to blame here? I was pleased to find that this place was located right across the street from my hotel so I was able to stroll across Highway 9 to have a little bite to eat. The interior is great, but most impressive is the lighting of the place. It’s fairly dark inside which I like but each table has some fantastic lighting over each place setting. This provided perfect lighting for a taco journalist like myself who did not bring a flash. I hunkered down and after looking over the menu, I decided to check out the Bit and Spur tamales. A happy little sweet potato and pork tamale. Waiting to get eated. 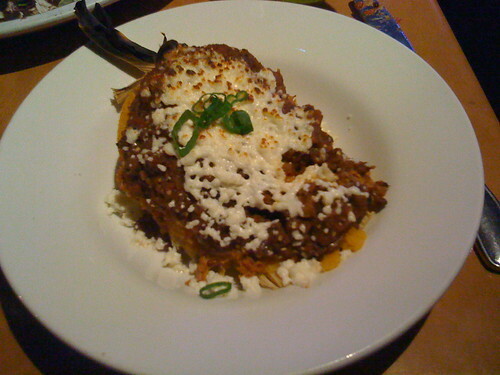 Again, this is not an authentic Mexican joint but I love inventive recipes like this one and I was not disappointed. The queso fresco was lightly browned over the entire tamal and the pork was savory so it was a welcome match against the sweet potatoes underneath. Each bite was a little bit of greatness. It was a bit like being a king. A tamale king. Plus, with the lighting being low, no one could see me stuffing my tamale-hole. This is a cheesecake cream between crispy wafers. 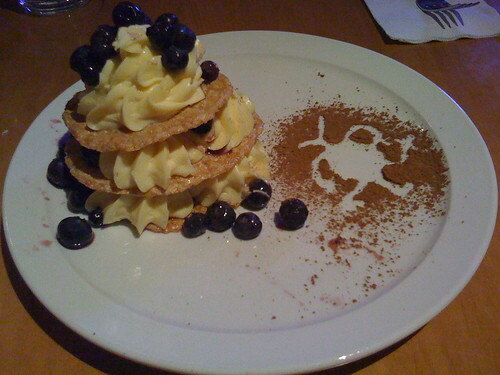 Topped with blueberries. Befriended by the god of fertility in powdered chocolate dust. Needless to say, this meal resulted in a serious food coma. It’s a good thing I did the Angel’s Landing hike before all of this or else I would have never made it beyond Mile 1. This place is great. 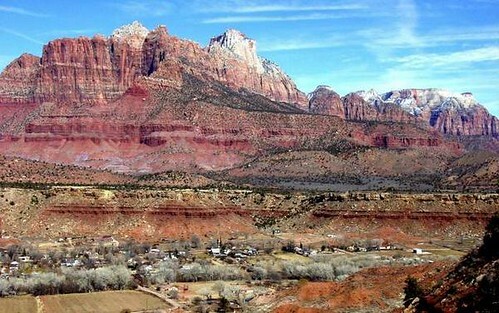 It’s not worth a trip of its own but if you’re around Zion’s I think it’s worth a little trip. And check the event calendar. You never know who might be making a musical appearance at this place. Finally I leave you with a picture of why I love Utah. I cannot help but be overwhelmed by vistas like this one. Fingers crossed that I can enjoy more of it this summer. Arriba Utah! Scenic views around Springdale, UT. Near Zion's National Park. There are some interesting comments on the story on the KSL site i want to address later, mostly dealing with the fact that many people seem to have the opinion that taco stands are not welcome in our communities, and even attract crime. What are your opinions, slctacos readers? I wish I had a mailman that would deliver me tacos. In fact, if I were given the choice I think I would choose taco delivery over mail delivery. Thanks for taco enthousiast Manda for sending this my way! February and March mark important times in taco history. The Battle of Taco-Jima (February 19–March 26, 1945), or Operation Elpastor, was a battle when the United States fought for and captured the Taco-Jima from Japan. The battle produced some of the fiercest fighting in the Pacific Campaign of Taco War II. The Japanese positions on the island were heavily fortified, with vast bunkers of picante sauce, hidden guacamole, and 18 kilometres (11 mi) of underground refried beans. The battle was the first American attack on the Japanese Home Islands, and the Imperial soldiers defended their positions tenaciously. Of the 22,000 Japanese soldiers present at the beginning of the battle, over 20,000 were left without tacos and only 1,083 taken prisoner. The U.S. invasion, known as Operation Elpastor, was charged with the mission of capturing the grand taco on Taco-Jima. The battle was immortalized by Joe Rosenthal’s photograph of the raising of the grand taco atop the 166 meter (546 ft) Mount Suribachi by five Marines and one Navy Corpsman. The photograph records the second taco-raising on the mountain, which took place on the fifth day of the 35-day battle. The picture became the iconic image of the battle and has been heavily reproduced.